Mum said my Russian Grandpa used to make a soup like this, I can't remember it. I do remember his tomato soup. I am not sure if it was homemade or out of the can, but I used to love the way he put cubes of cheese at the bottom of the bowl. It's one of my favourite memories of him cooking for me. The other thing I recall always seeing in his fridge is Rollmops. It must have been where my taste for them came from. My brother surprised me a few weeks back when he rang me from Adelaide where he was visiting. He was in Hahndorf and asked me if I wanted some. It lightened my heart because he had thought of me when he saw them, remembering my taste for them, which in turn reminded me of my Grandpa. It's kind of a relief, for your sake, that this soup doesn't have rollmops in it, the pickled fish are an acquired taste and not everyones cup of tea. 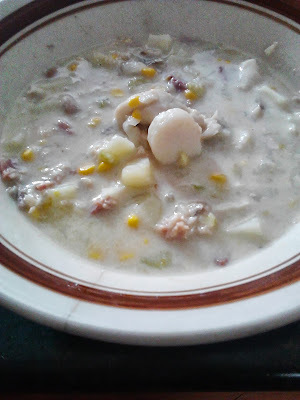 *I used frozen scallops from the supermarket. If you don't have them you can just use 500 grams of fish. You can use mussels(in the shell) for something fancy. Add them for the last two minutes and serve on top of soup. Heat oil and fry bacon until just starting to crisp. Add onion, celery and garlic and fry until onion is soft. Add flour and stir in for a minute. Add potato, milk and stock, simmer until thickens, about 5 minutes. Add corn and fish and cook until fish is opaque. Add in scallops for the last two minutes. There is so many flowers coming out in the garden right now, in just about every colour of the rainbow, it's getting hard to keep up. I love the surprise of going out and seeing something else coming out in flower. Here's some of the pink flowers on show right now. I've had a box of canned asparagus at the bottom of my pantry for ages. After giving me a few cans, Mum decided to give me the whole box she had bought in bulk. I used some to make a delicious quiche, that was over a year ago. You could use ham or bacon instead of the mortadella. 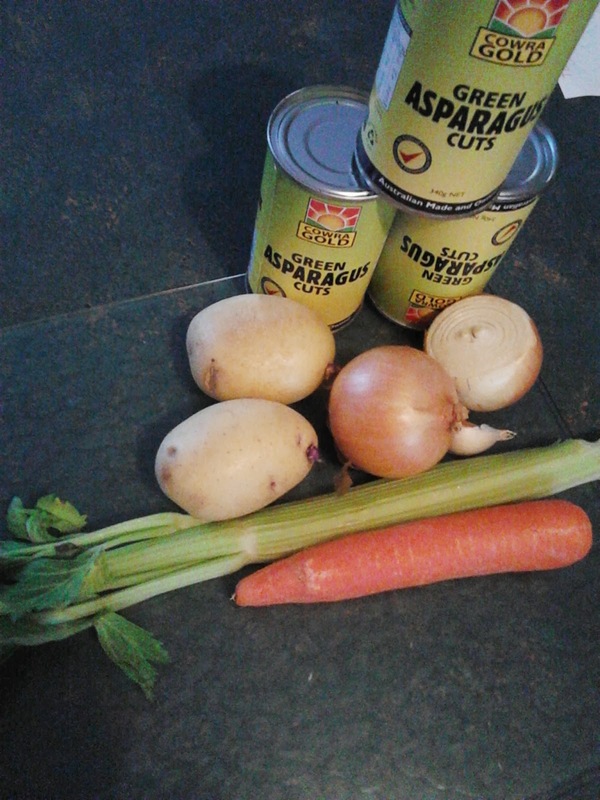 Don't be too fussy how everything is cut up, the soup is going to be blitzed anyway. 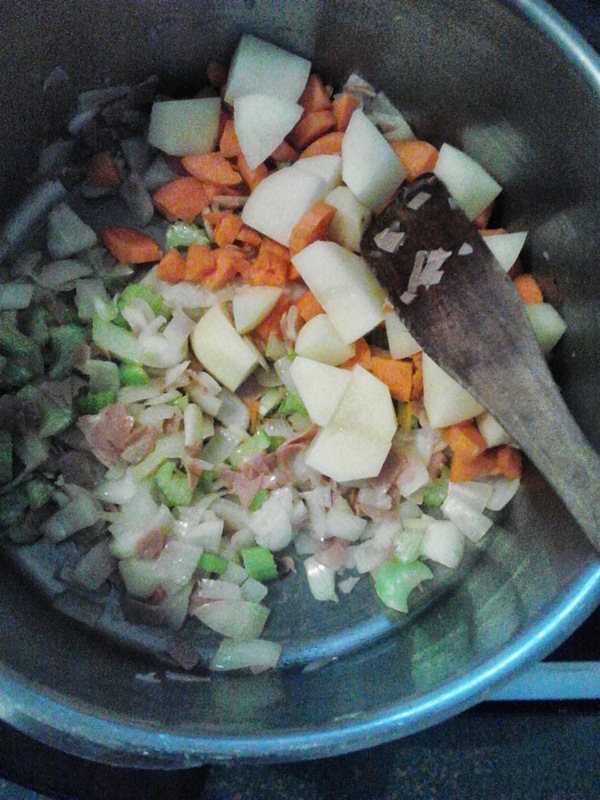 Cook mortadella until just starting to crisp, add onion, celery and garlic. Cook until onion is soft. Add potato, carrot, asparagus, milk and stock. Bring to the boil, then simmer covered for 20 minutes, or until potato is soft. Take it off the heat and blitz with a stick blender. Add salt and pepper to taste and serve. Izzy and Summer. They are so much alike, yet so different in so many ways. Both have their own ways of driving me nuts, yet fill me with so much laughter, pride and joy. They love each other, yet sometimes need their own space. They can be fighting over something one minute and cuddling the next. They are sisters, they are love. I found this little beauty a few weeks ago; I'd never heard of it before this herb caught my eye at Plants Plus. After I crushed the leaves between my fingers and had a whiff, I had to have it. It's Santolina rosmarinifolia, the olive herb. It really smells and has the flavour of olives. I made foccacia last week and used this chopped up on top before I baked it. I chopped it up with parsley and basil mint and put it in the pasta sauce on Tuesday. It would probably be awesome in a salad dressing too, used to flavour meats or sprinkled atop a pizza. Saves the fussy kids screwing their noses up and picking off the black bits of olive, what they can't see won't hurt them. It is a welcome and useful new herb in my garden. In late Summer it comes out with small yellow button flowers, and grows up to 50 cm high.